AEG received a contract in 1916-17 to build the AEG R.II 205/16. This design fell into the same category as the Junkers and Staaken thick-wing all-metal monoplane projects intended for day-bombing use. On 17 January 1918 the Daimler-Motoren-Gesellschaft booked an Idflieg order for a complete power system consisting of eight 260 h.p. Mercedes D.IVa engines, six double-cone couplings, two transverse transmission drives and a flywheel mounted ahead of the starter coupling. This system was intended for the AEG R.II, which, according to Daimler, had the following particulars: wingspan, 45•9 m., length 24•2 m., wing area 325 sq. m. Empty weight was estimated as 12,480 kg. (plus 530 kg. not identified). Fuel to be stored in 12 tanks and weighed 5000 kg. The tractor propellers were two-bladed with a diameter of 5•20 m.; the four-bladed pusher propellers had a diameter of 4•80 m. Estimated top speed was 145 km.h. and climb for 1000, 2000 and 3000 m. was 12, 26 and 41 minutes respectively. Duration was 12 hours for a range of 1600 kilometres. The Dornier works at Lindau had constructed several all-metal wing spars that AEG load tested for their monoplane project. Another AEG R-plane project, mentioned in official reports in September 1918, had four 245-h.p. Maybach Mb.IVa engines and one 500 hp. Benz Bz.VI or Maybach Mb.VI driving a total of three propellers. The report stated that the project would be held in abeyance for the time being. The AEG R.II remained on the drawing boards, as did the AEG triplane project with four 500 h.p. Mercedes engines and a wingspan of 35 metres, not to be confused with but probably similar to the AEG-Aviatik project mentioned in the next chapter. The Navy also ordered several AEG giant aircraft in 1917 and 1918, but virtually no information exists outside of a brief mention in an official Naval document. In October 1917 an order was placed with AEG for a biplane R-seaplane with four 245 h.p. Maybach Mb.IVa engines. The number initially assigned to this type was 2139, which was later changed to 9301. Marine Baumeister Neesen recalls that this type was basically a modified R.I equipped with floats. Two more naval R-planes were ordered in January 1918, having the numbers 9302-9303. Their configuration is not known, other than that the engines were to be four 245 h.p. Maybach Mb.Iva engines. Toward the end of 1917 Idflieg, greatly influenced by the load-carrying capacity of the Caproni triplanes, fostered the construction of multi-engined triplanes, the only completed example of which was the LVG G.III. However, AEG and Aviatik undertook a joint project to build the largest R-plane envisioned at that time. The experience of both organizations was enlisted in this ambitious project, construction of which, it is claimed, was actually started in Stettin but was halted by the Armistice. By the end of 1917 most of the test data concerning efficient triplane configurations had already been collected from wind-tunnel tests at Gottingen. During the early design stage Idflieg suggested that it might be feasible to build a 4 to 1 flying scale model to test the performance characteristics of the proposed giant. The model was to have 12-14 metre wingspan, an area of 40 square metres and a loaded weight of 1400 kg. However, the engine weight would be far in excess of the 4 to 1 scale ratio, forcing the designer, Ludwig Maurer, the Chief Engineer of Aviatik, to the conclusion that a model aircraft, in this case, would be unfeasible. Not until the advent of high power-to-weight ratio engines, would scale models become a tool to test the characteristics of larger aircraft. 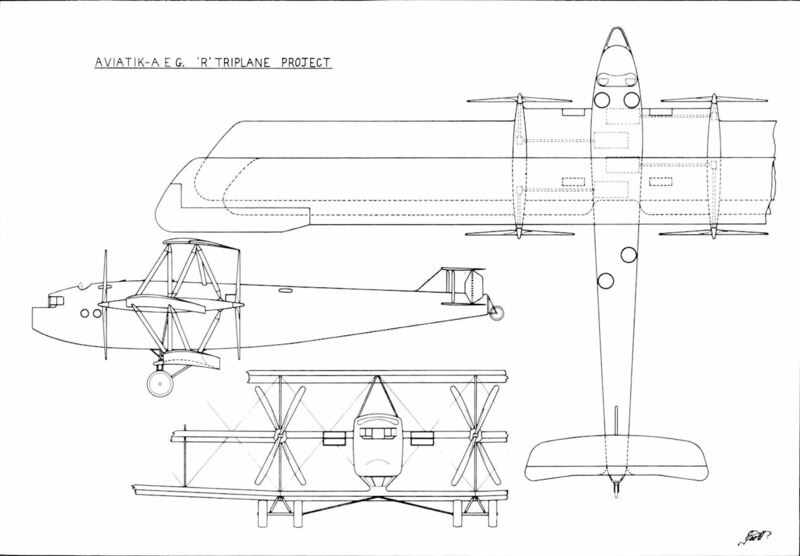 The partially completed aircraft was centrally powered and presented another solution of the engine arrangement problem; in this instance the engines were mounted athwartship side by side, and each drove a single propeller by means of an extended shaft leading through the middle wing to a right-angle bevel gear-box, which eliminated the usual bulky gear and clutch systems. This and the DFW power transmission were the simplest of the central-engine systems. Although eight 250 h.p. engines were initially proposed, the advent of the 530 h.p. 12 cylinder Benz Bz.VI engine permitted the use of only four engines to attain the required 2000 horse-power. These were to be supercharged by a 120 h.p. Mercedes D.II engine driving a centrifugal compressor. Four bullet-proof and fire-resistant tank were mounted beneath the engine bearers and had a total capacity for 8 hours' flight. The radiators were mounted on the centre wing in the slipstream of the tractor propellers. As usual, the nose was fitted with a large machine-gun post which doubled as an open navigating position for the aircraft commander-navigator. This was followed by a fairly large closed navigation cabin, above and behind which was situated the roomy open pilots' cockpit, arranged to afford a clear view in most directions. Underneath the cockpit it was planned to have a wireless station equipped with wireless receiver, sender, sound amplifier and a dynamo which would also serve to provide illumination for night flying. Commands would be transmitted throughout the aircraft by a machine telegraph system and pneumatic tubes. A walkway made it possible to step from the wireless station into the engine-room through a large sound-proofed bulkhead and walk to the rear of the aircraft. The fuselage was to be constructed of four massive wooden box longerons with steel-tube cross struts and engine bearers. The wing structure was heavily staggered, reminiscent of the experimental Nieuport triplanes and shown to be an efficient arrangement by the Gottingen wind-tunnel tests. The lower wing was attached to the fuselage by a streamlined extension containing the bombardier's cabin. The aircraft was studded with machine-gun posts: one in the nose, two immediately behind the cockpit (one wonders how the pilots would have liked this); two behind the wings; one in the extreme tail, and perhaps several on the underside of the fuselage. Each crew member was to be provided with a parachute stowed near his post so that it would be instantly accessible. The landing gear used steel springs a shock absorber and the wheel were possibly of the steel-band type developed by Linke-Hofmann. The tail skid consisted of a sprung-wheel carriage which could be steered. Although the AEG-Aviatik R-plane project was described in detail by the German post-war aviation press, nothing was said about its degree of completion, other than that it was "partially completed". It is very doubtful, however, if the project advanced materially beyond the barest preliminaries. The AEG-Aviatik R-plane belonged to the third generation of giant bombers in the same category as the massive Staaken R.VIII and R.IX, AEG R.II and DFW R.III. Ceiling, 5000 m. (16,405 ft.) in 120 mins.